Open for only 2 months the Autostrada is a relatively new restaurant located on Market Street in Scottsdale's DC Ranch. Serving up straightforward, delicious Italian food at reasonable prices makes it a welcome addition to the area. Although I was very impressed by the food and happy with the service the restaurant's atmosphere leaves a lot to be desired. The dining area is a long narrow room with connected bench style seating along one wall and a semi exposed kitchen along the other. Not very romantic or comfortable. It's saving grace is a large outdoor patio seating area. I'm a firm believer that there's nothing good food and wine can't fix. And what the Autostrada lacks in atmosphere it more than makes up for with the food. Nothing on the menu is priced over $18 and portions are sized accordingly. This is not to say that they are small; but more on the line of what a portion size should be. To me the menu promotes sharing; which is exactly what my husband and I decided to do on our recent visit. We started with the Italian cheese plate. Along with hunks of 5 different cheeses there were also two fruit mostardo's, a bowl of green olives, some fresh fruit and nuts. 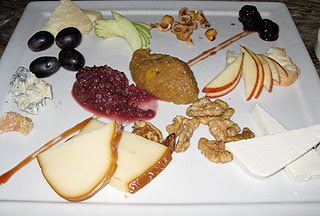 I loved the variety of the cheese; from smoked mozzarella, to ricotta salata, to a creamy taleggio there was something on the plate for all tastes. 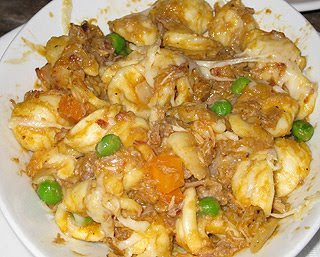 Next we shared a bowl of orecchiette pasta that was baked in a pork sugo with peas and sprinkled with pecorino nero. With it's sharp nutty almost floral flavor the pecorino nero really came through in this dish. After that we shared the braised veal entree. We were served four melt in your mouth veal cheeks cooked in a Marsala sauce; layered on top of the creamiest polenta I've ever tasted; and mixed with wild mushrooms. This dish was stellar. For dessert we shared a mascarpone tart. 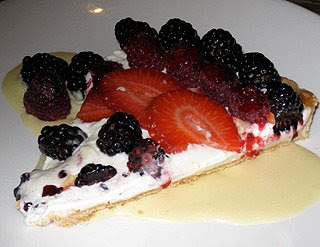 The tart was topped with fresh berries and was delicately place on top of homemade zabaglione. It was delicious. My husband and I both really enjoyed the food at Autostrada and will definitely make a return trip. However, next time we will dine outside. Great review! That mascarpone tart looks so good. I'm not to crazy about connected bench seating either, but the food looks amazing and the cheese plate sounds great! I am definitely gonna have to pay it a visit. Thanks for the tip! Yum! I could have made a meal out of the cheese plate alone. What a lovely meal! Everything looks great! That look s like a really nice meal! T, Looks as good as any nyc restaurant. That cheese plate is lovely and the sugo looks pretty authentic. We will have to check it out on our next visit out the wild west. Nice review.. the mascarpone tart looks so lovely too!